Ironman Austria was one of the expansion races Ironman launched in the late 1990s and has enjoyed some big-name winners over the years, including Ironman world champions Peter Reid, Faris Al-Sultan and Jan Frodeno (last year’s winner). On the women’s side three Austrians have taken the title in Klagenfurt: Kate Allen claimed a couple of Ironman Austria titles in 2003 and 2005 (in 2004, Allen, who became an Austrian citizen after moving from Australia, took the 2004 Olympic title), Eva Marie Dollinger won in 2010 and Eva Wutti won in 2015 and 2017. Until this year, though, we’d never seen a home-country men’s win. Micheal Weiss changed all that this year, though, thanks to a stellar bike split that pulled him clear of the field and in control of the race. SRM sponsored triathlete, Michael Weiss, was crowned the Ford Ironman Cozumel Champion on Sunday 1st December 2013. Along the way he produced the fastest bike split of the world class field by the impressive margin of 12 minutes and then went on to run the third fastest run split. 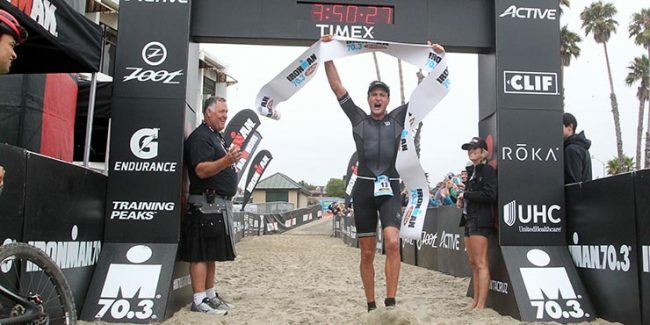 Certainly Michael’s mountain biking background and pedigree as a former Olympian, European U23 Champion and World Xterra Champion translates directly to his ability on the triathlon bike.